***** DISH OF THE WEEK (Sunday-8/26/18- China Gardens Restaurant). Jeff Eats and Mrs. Jeff Eats have been real steady China Gardens Restaurant customers since March 17, 2009. 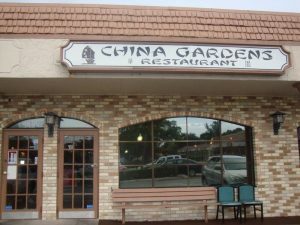 ***** China Gardens Restaurant, 14400 Military Trail, Delray Beach, Florida 33484 (561) 498-5226. 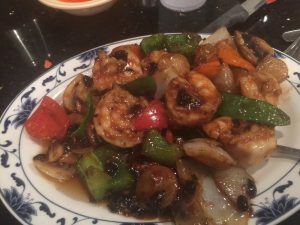 A number of you guys e-mailed about a “mom & pop Chinese” joint…China Gardens Restaurant, telling me about how good the food was, blah, blah blah. Anyway… last night I gave this joint a shot and “right-you-were”…the food is absolutely delicious. China Gardens Restaurant is as you would expect, a “hole in the wall” located in a non-descript small South Florida shopping center. Guaranteed (unless you are a recent arrival from Mars) you know exactly what the decor is…what the menu is…and what the price-points and “specials” are. Now I may-be going out on a limb here, but…my money says that China Gardens Restaurant is probably better than your favorite neighborhood-Chinese joint. Let me go one step further, China Gardens could “make it” in New York City’s Chinatown. Based on my first outing, I will definitely be back for a second round. China Gardens Restaurant is open Monday-Saturday 11am-10pm and Sunday 2pm-10pm. My wife and I have been eating there for years. Veru good food and very good service. Prices are definitely reasonable. The only dish that I have eaten there that was not good was General Tso’s Chicken. Lousy! Their lobster Cantonese is outrageously delicious and their egg rolls are some of the best I’ve eaten in Florida. You really can’t go wrong eating at China Gardens. Love their ribs and egg rolls. Their General Tso’s Chicken isn’t good. .
My husband and I have been eating there for over 23 years. I love their food. Can’t think of a single dish that isn’t delicious. Their ribs are sensational. This joint is an absolute must try. If you’re from NYC and grew up there in the 50s-60’s, this joint will be right up your alley. Must tries include bbq ribs, lobster Cantonese and pepper steak. Best bbq ribs in Florida.